Tungsten Gravity Screw lower the center of gravity for a high trajectory. High-launch, low-spin takeoff translates into longer carries and extra roll upon landing for added distance. 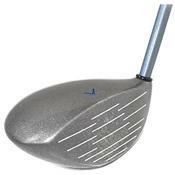 Oversize head sports enhanced perimeter weighting for stability at impact and straighter drives. I'd put these up against anything on the market today. This is a club that was ahead of it's time. Very long, and the tungsten weight screw provides a higher than average trajectory. Just stole the 3 and 5 wood for $20 apiece at a local shop and they perform like clubs ten times as expensive.